After what we’ve seen from the first two matchups, a playoffs matchup with LeBron facing off against DeMar and LaMarcus would be an NBA dream. 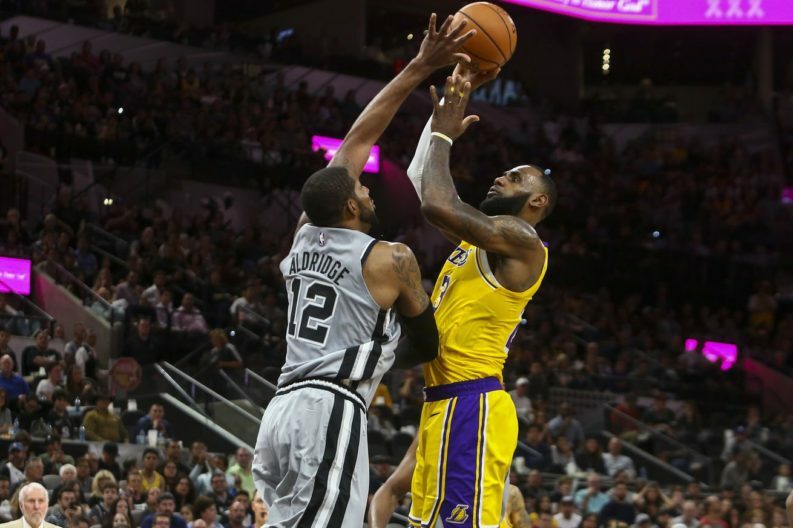 It doesn’t quite feel fair that there are only two more games scheduled between the Spurs and the Lakers this year. They meet again on December 5th and December 7th — and that’s it — done for the rest of the regular season after that. Besides maybe Steph Curry’s glorious three-quarter, 51 point explosion against the Wizards, Monday’s multiple-change-of-momentum overtime thriller and Saturday’s Spurs comeback rank among some of the most entertaining games we’ve seen during the early sweep of the season. That’s because DeMar’s shooting has been lights out, utilizing footwork that is both endemic to DeRozan’s style of play and simultaneously unreal to watch in action. It’s because LeBron has done LeBron things. More broadly, these games have been entertaining because the Spurs’ offense has begun to open up in a way that was unthinkable last season: San Antonio had three options when they ran a play that ultimately became Patty Mills’s game-winner during the first match-up against Los Angeles. DeRozan — while still being lights out — has also made a point of sharing the ball more than what most probably expected from him . But that changed in the fourth: there was a successful double-team of JaVale McGee who was trying to post-up on the weakside. There was a successful double-team of Josh Hart after a hand-off from Rondo in the fourth, a double-team that — as mentioned in the above tweet — was built on communication. The Lakers began the game with 36 points in the first quarter and ended the game with a fourth quarter filled with miscommunication in which they only managed 18 points. And while Lakers fans can point with some justification to the growth of Kyle Kuzma as a shooter — who scored 37 points against the Spurs in Los Angeles and had a nasty dunk against them in San Antonio — Spurs fans can point to the fact that maybe, the team is more capable than many gave them a chance of being this year. After a pair of games between the two teams, we were treated to a) an overtime contest with two massive point swings at the end of the 4th and regulation, and b) a 14-point Spurs comeback that came down to the wire. How could we not want more of that?